IT’S the play that rocked with laughter when it first toured, and if you didn’t catch Seriously Dead the first time round, well, it’s heading to The Brunton on Saturday. The comedy that takes a more than irreverent look at the afterlife stars Tommy Cannon, one half of the legendary double-act Cannon and Ball. 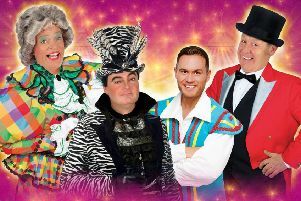 He joins what is already a close-knit family consisting of Crissy Rock of Benidorm fame, funnyman Billy Pearce, Paul Dunn and ‘producer/actress and anything else that needs to be covered’ Leah Bell. Bell recalls it’s not the first time she has worked with the star of the recent ITV series Last Laugh In Vegas. She says, “We worked together 30 years ago in a summer season and we got on so well. “I’d been watching Not Going Out, and his long-time stage partner Bobby Ball had a role in that, I wondered to myself if Tommy would be up for something different. The two met to discuss the proposition. Cannon admits: “It’s all very different from the act that Bobby and I do, which is structured but also fairly free-wheeling. “A stage play means learning lines, for a start, lots of them, and, of course, sticking to them. “You can’t wing it and go off-course. The rest of the cast would never forgive you. “Leah and Bobby and I got on like a house on fire all those years ago, and we always kept in touch. Cannon plays small-time crook and ladies’ man Albert Blunderstone, who, he says, “is best summed up as having a finger in a lot of dodgy pies, and a bit of a northern Del Boy”. That ‘try owt’ attitude seems to just about sum up Cannon’s attitude to life, and his career in general. “If you don’t go for it, and give it your best”, he says, “what’s the point of going on?